Your Survivor Scoop – first edition! This will be sent to you each month, and will include updates about upcoming events, programs, volunteer opportunities, and survivor support activities; a “Survivor Spotlight” recognition; survivor birthdays* for the current month; and more! We want to ensure we are supporting survivors that are involved with the Colon Cancer Prevention Project in ways that are meaningful to YOU! Please share your ideas and feedback with Lindy Reinhardt by replying to this email or sending a new email to Lindy at LReinhardt@kickingbutt.org. 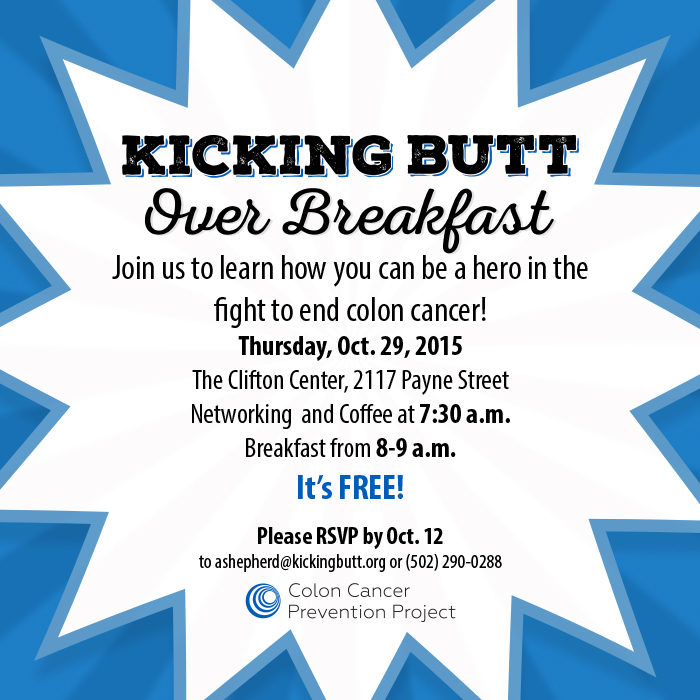 to learn more about the Colon Cancer Prevention Project’s huge impact in our region, and how you can be a part of its future. It also will be a great networking event; a coffee and networking time will be from 7:30-8 a.m. The breakfast is free but you will be invited to make a gift if you would like to support the Project’s work after hearing about it. You also will have the opportunity to learn more about volunteering for this organization. We hope you can attend this event! You are #kickingbutt and we thank you for your continued support and involvement! *Please email your birthday to Lindy at LReinhardt@kickingbutt.org to ensure we have accurate information to include in upcoming newsletters. We wish for wonderful birthdays and amazing years ahead for all the above listed survivors! Enjoy the special day! These amazing superfoods are either hitting their peak in the garden or can easily be found in your local farmers market or grocery store.Apples, brussels sprouts, parsnips, and more! Read all about these superfoods through this link. Do you have a favorite food you incorporate in your Fall cooking for healthy eating? Email Lindy at LReinhardt@kickingbutt.org to share! The Colon Cancer Alliance offers many relevant webinars that may interest you. These webinars focus on a variety of topics, including “Colon Cancer Under 50: Latest Update On the Numbers”, “It Runs in the Family: Colon Cancer & Genetics”, and more! You can view previously recorded webinars and register for upcoming webinars through this link. We hope you find these to be helpful. We are interested in ensuring that the topics that interest you are covered by webinars in the future, whether sponsored by the Project or the Colon Cancer Alliance. Please share your thoughts about topics you would like to see included in future webinars by emailing Lindy at LReinhardt@kickingbutt.org.